Stepgain follows the markets trend, and buys or sells as soon as the trend reverses. Assuming a trend reversal (from downtrend to uptrend) usually takes place close to the bottom of a price movement, this allows you to buy shortly after a price bottomed. Similarly, selling takes place when an uptrend turns into a downtrend. Trends are calculated automatically, taking into account your settings for PERIOD. You can optionally use indicators like RSI or Stochastic as confirmation to only buy or sell when both a trend reversal and a specific indicator level occur. These parameters control the execution of buy orders when using stepgain as buying strategy. TRADING_LIMIT 0.002 Values: numerical – represent an amount in primary trading currency. This value defines the trading limit for buy orders placed by Gunbot. The default value of 0.001 would place maximum orders of 0.001 BTC when used on a BTC_x pair. Only use whole numbers for fiat pairs. BUYLVL1 0.6 Values: numerical – represents a percentage. Relevant: only when stepgain is used as buying strategy. This sets the level 1 target for buying with stepgain as buying strategy. BUYLVL2 2 Values: numerical – represents a percentage. Relevant: only when stepgain is used as buying strategy. This sets the level 2 target for buying with stepgain as buying strategy. BUYLVL3 70 Values: numerical – represents a percentage. Relevant: only when stepgain is used as buying strategy. This sets the level 3 target for buying with stepgain as buying strategy. BUYLVL 2 Values: 1 / 2 / 3 – represents steps. Relevant: only when stepgain is used as buying strategy. This sets which step should be considered when using stepgain as buying strategy. 1: Buy when price drops below BUYLVL1 and stops dropping or hits BUYLVL2. 2: Buy when price drops below BUYLVL2 and stops dropping or hits BUYLVL3. 3: Buy when price hits BUYLVL3 and stops dropping. These parameters control the execution of sell orders when using stepgain as buying strategy. SELLLVL1 0.6 Values: numerical – represents a percentage. Relevant: only when stepgain is used as selling strategy. This sets the level 1 target for selling with stepgain as selling strategy. SELLLVL2 2 Values: numerical – represents a percentage. Relevant: only when stepgain is used as selling strategy. This sets the level 2 target for selling with stepgain as selling strategy. SELLLVL3 70 Values: numerical – represents a percentage. Relevant: only when stepgain is used as selling strategy. This sets the level 3 target for selling with stepgain as selling strategy. SELLLVL 2 Values: 1 / 2 / 3 – represents steps. Relevant: only when stepgain is used as selling strategy. This sets which step should be considered when using stepgain as selling strategy. 1: Sell when price rises above SELLLVL1 and stops rising or hits SELLLVL2. 2: Sell when price rises above SELLLVL2 and stops rising or hits SELLLVL3. 3: Sell when price hits SELLLVL3 and stops rising. General settings for stepgain including the relevant indicators for this strategy. See the overview of supported periods per exchange for correctly setting PERIOD. PERIOD 15 Values: numerical – represents candlestick size in minutes. Only use supported values, see the overview linked above this table. TRADING_FEES 0.25 Values: numerical – represents a percentage. This sets the amount of trading fees that needs to be considered for each trade. EMA1 16 Values: numerical – represents an amount of candlesticks. Set this to the amount of candlesticks you want to use for your long EMA calculation. The closing price for each candle is used in the EMA calculation. For example: when you set PERIOD to 5, and want to have 2h for long EMA – you need to set EMA1 to 24 (24 * 5 mins). EMA2 8 Values: numerical – represents an amount of candlesticks. Set this to the amount of candlesticks you want to use for your short EMA calculation. 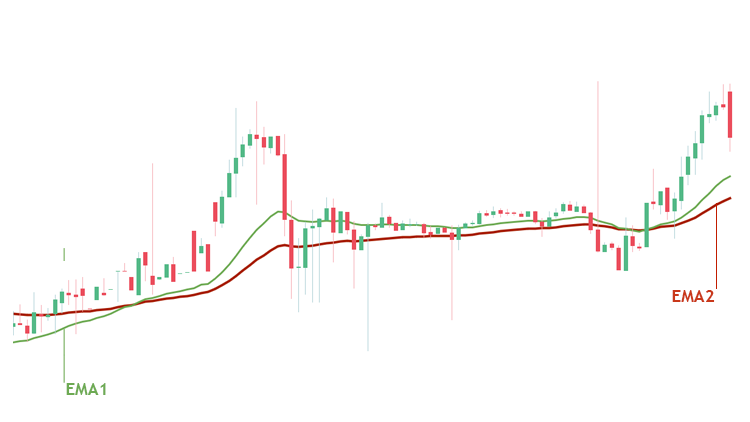 The closing price for each candle is used in the EMA calculation. For example: when you set PERIOD to 5, and want to have 1h for short EMA – you need to set EMA2 to 12 (12 * 5 mins). TRADES_TIMEOUT 0 Values: numerical – represent time in seconds.This sets a timeout preventing any trades to be placed for a pair after the last order and after starting the bot. Use this to prevent double buys or fast consecutive buy orders when averaging down. Affects buy and sell orders. When the timeout is active you will see Waiting to Trade - Safety Switch is on in the logs. BTC_MONEY_FLOW 35 Values: numerical, ranging between 0 and 100.Sets the value on the Money Flow Index (MFI) you want OKKIES_MODE to disable buy orders. As soon as MFI hits the set value or drops below it, OKKIES_MODE will be enabled. TRAIL_ME_RT false Values: true or false. Use this to enable tssl-style trailing for RT_BUY orders. RT_SELL_BUYDOWN 1 Values: numerical – represents a percentage.Defines the percentage drop after initial buy or RT_BUY to trigger RT_SELL. Make sure to set this higher then the spread between bid and ask to prevent unwanted buybacks. IGNORE_TRADES_BEFORE 0 Values: unix timestamp in milliseconds (in GMT)Optional parameter to force reversal trading to ignore trades before a set time. Use https://currentmillis.com/ to convert human readable time in GMT to unix timestamps, make sure to use the timestamp in milliseconds. DU_CAP_COUNT 0 Values: numerical – represents a number. Limits the amount of times a Double Up order can be placed for a pair. The default setting of 1 would limit Double Up to only 1 buy before it waits to sell. When you set this higher, the bot will invest more and will get a lower average bought price to get rid of your bags faster. These settings have no practical function in stepgain. GAIN 0.6 Only acts as a security settings, as long as this is set lower than the relevant sell level, it will be ignored.